Is it possible to grow a monster in less than 60 days after germination? Yes, it is. Green Monster Autoflowering is extremely fast, has a THC content of 15%, and all the growing traits one can expect from a reliable autoflowering variety. It doesn’t get too big, delivers buds of high potency, and has interesting flavours to offer. Overall an excellent, indica-dominant autoflowering strain. Green Monster Autoflowering doesn’t get very tall in its short life cycle of 55-60 days. This can be very beneficial when growing on balconies, roof terraces, or in smaller grow tents. When growing indoors, one can expect overall heights between 60-90cm, and yields of up to 300-350 g/m². These green monsters tend to get a little bigger outdoors, up to 70-120cm tall. Outdoor yields are within the range of 70-120g per plant, assuming warm and sunny growing conditions. Flavour and high are both very satisfying. The taste is leaning towards being sugary-sweet by having noticeable hints of spicy elements at the same time. Fresh flavours of lemon subtly contribute to the very pleasing aromatic performance of Green Monster Autoflowering. The high allows both, daytime and nighttime consumption. 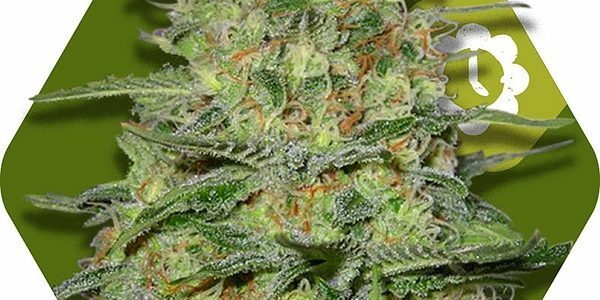 The effect is not mind-twisting strong, but definitely strong enough to induce happy feelings, along with a classic Indica body-stone. Green Monster Autoflowering is the ideal variety for growers seeking a short life cycle, a medium-strength physical stone, and a nice fusion of sweet, spicy, and lemon-like aromas. The fact that this strain stays rather compact throughout its life makes it highly interesting for smaller grow tents, as well as outdoor growers aiming for maximum stealth, reliability and growing speed. Growers who like this strain might want to try Big devil 2 !